If you have a site and you already have an event plugin to manage your events, then you can show these events easily in cool calendars at your site (eg. in a widget, a page, etc.). Very useful for sites like gyms, schools, bars, restaurants, concert halls, etc. Choose between month, agenda, list and basic view. You can show any custom post type in your calendar. You can show multiple custom post types in the same calendar. Create as many calendars as you desire. Choose between 11 ready-to-use themes and make cool calendars on the fly! You can use multiple calendars on the same page. You can customize each calendar separately. Style the calendar the way you want! Choose background color, borders, margin, padding options and many, many more. Select from a large library of Google fonts and set the desired typography for all your calendar texts. You can set the calendar’s date range. All events outside the date range are hidden and the navigation buttons are deactivated. Choose the navigation buttons that you want displayed on the toolbar. You can add a filtering dropdown and give the user the abillity to show specific events only. If you have a large number of events in the same day, you can set an event limit. If you want, you can add colors to your event taxonomies and colorize your events according to their taxonomy colors. Enable caching for calendar events. 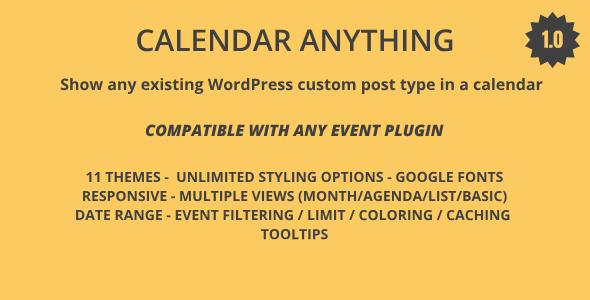 Get calendar events by using ajax or by prerendering all of them. You also have the ability to add tooltips on your events. With our plugin you can create trully responsive calendars. Which means that on larger screen you can a different view than on smaller screens. We provide fast and reliable support to our customers. You can count on us for after sale support and continued development of the plugin. Take a look at our extensive online documentation.